Here's a vintage flower arrangement that's both unique and simple to assemble. 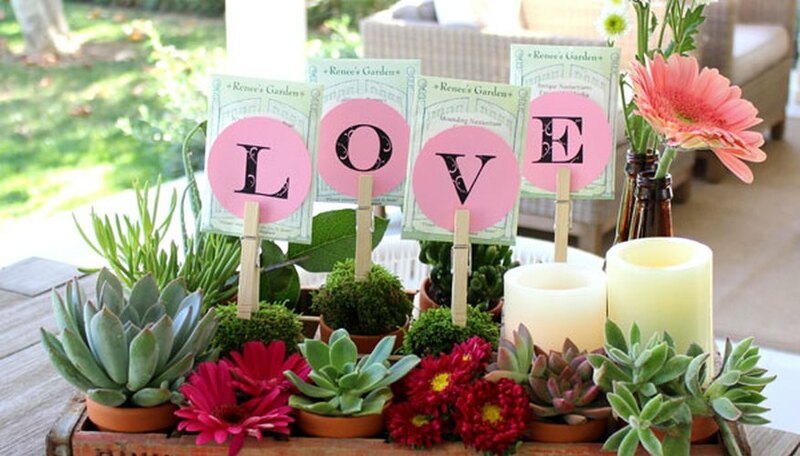 A weathered soda crate, with its many compartments, allows you to create a modular arrangement with various elements, like succulents, cut flowers, candles, and even seed packets spelling out "L-O-V-E." Not only perfect for Valentine's Day or Mother's Day, it's a beautiful centerpiece for a spring party as well. To make this arrangement, you'll need a vintage soda crate with 24 compartments. Soda crates are available at flea markets and online auction sites. 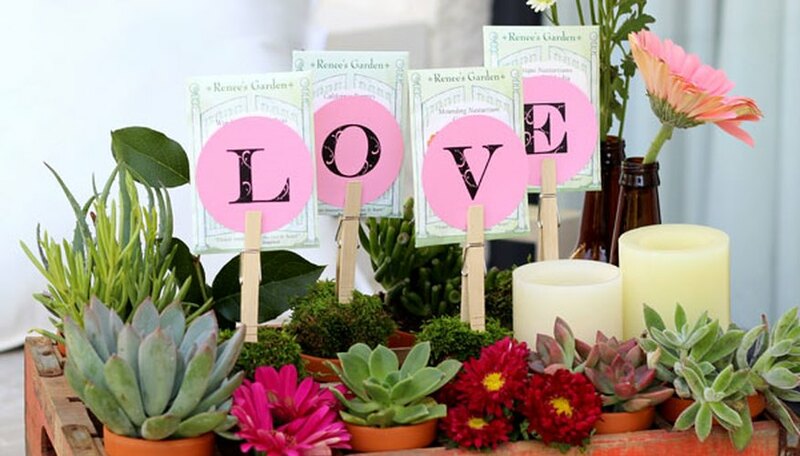 You'll also need soda bottles, succulents, cut flowers, small clay pots, glass votive holders, sheet moss, seed packets, clothes pins, skewers, pink paper, and LED candles. For this project, purchase plenty of small clay pots, about 3 inches in diameter at the rim. They are very inexpensive and available in crafts stores and nurseries. 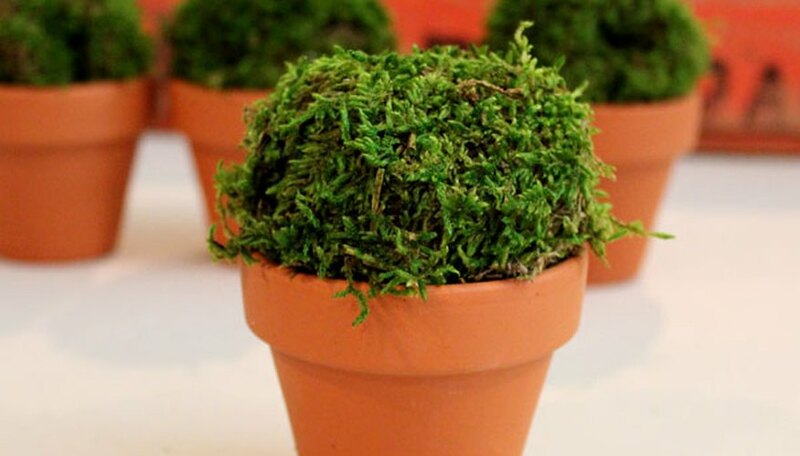 To make the seed packet topiaries that spell out "L-O-V-E," start by rolling some sheet moss into balls and stuffing them into clay pots. 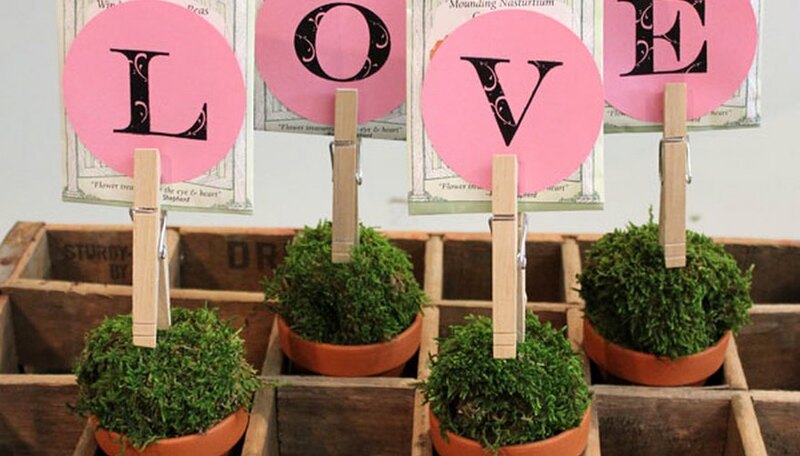 You'll find sheet moss in the floral supply section of crafts stores. 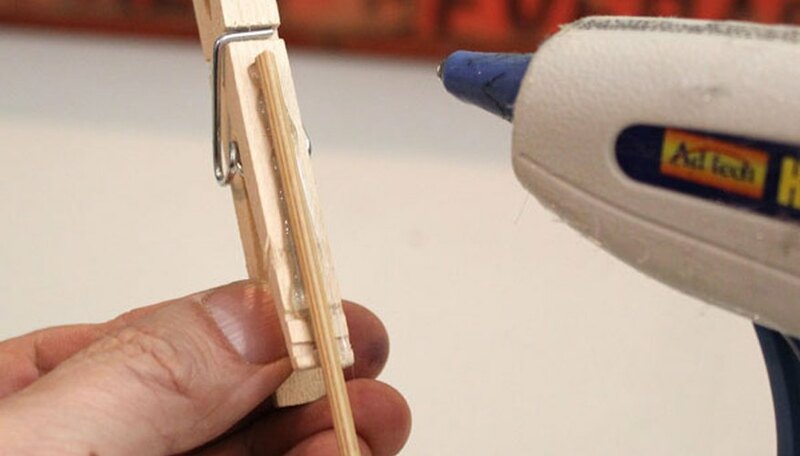 Cut a wooden skewer in half and hot glue it to one side of a wooden clothes pin. 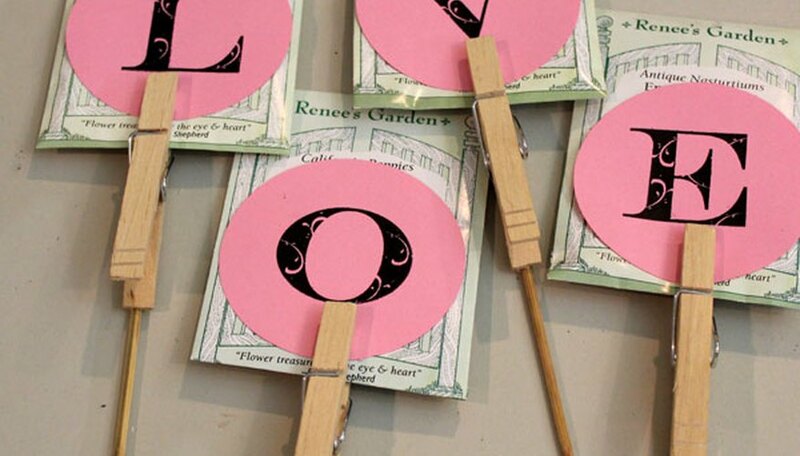 Cut out some pink paper into circles, or any shape you desire, like hearts, and write the letters L, O, V and E on them. You can also print the letters out onto pink paper and cut them out afterwards. (Alphabet rubber stamps were used for this project.) Then layer the letters on top of the seed packets, and hold them together with the clothes pins. Insert the skewers into the moss balls, and arrange the clay pots in the soda crate. I staggered them in different rows so the seed packets would not bump into each other. Instead of spelling out "LOVE," you can also use the letters of someone's name, or even pin photographs. 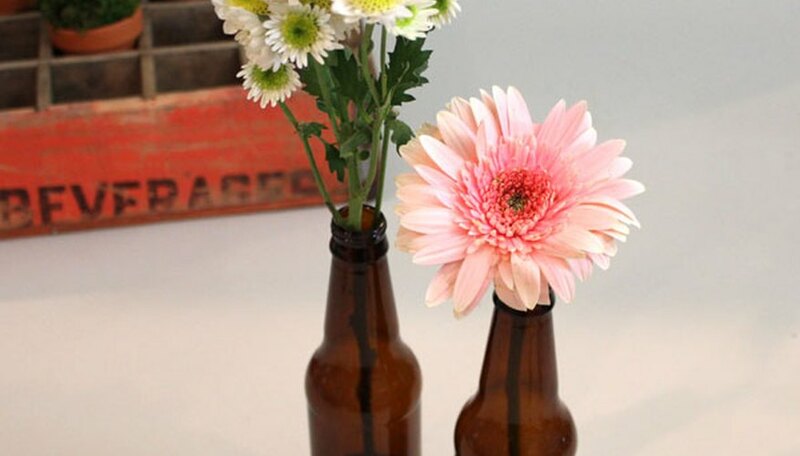 Soda bottles make great bud vases, and they add height to the arrangement. I selected root beer bottles because I like the amber color. Place the bottles toward the back of the arrangement so they do not cover the shorter elements. 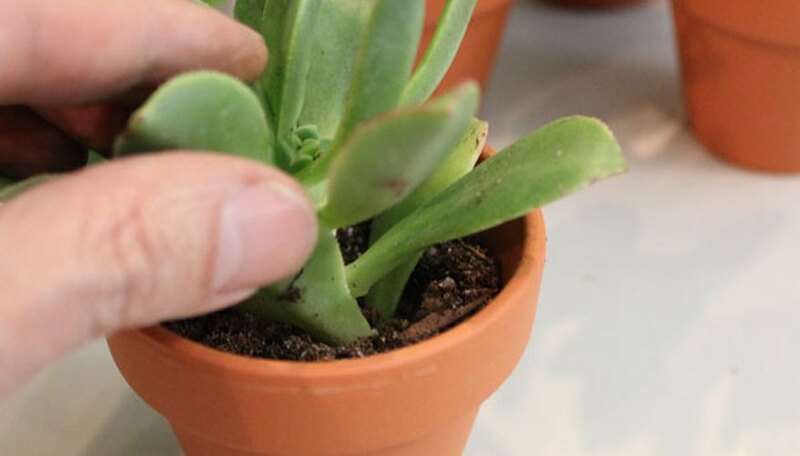 Whether your succulents are from your yard, or in plastic containers from the store, transplant them in the small clay pots. This will give all the succulents a uniform look, as well as complementing the seed packet topiaries. Then place them throughout the soda crate, with the taller succulents in the back and the shorter ones toward the front. 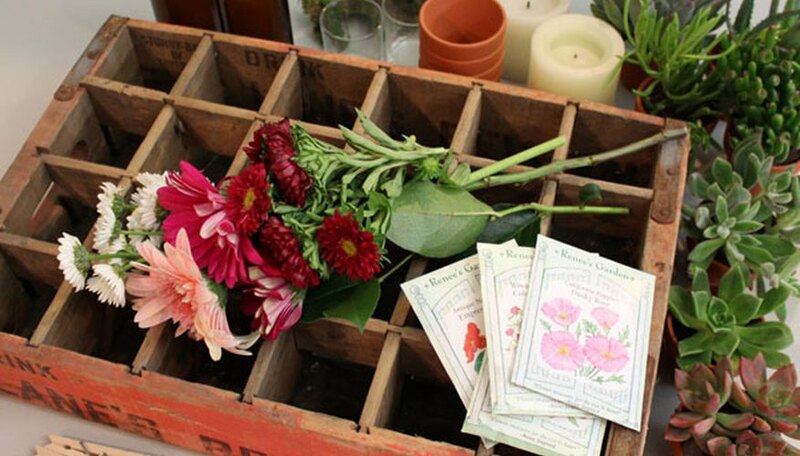 For more pops of color, place some cut flowers in glass votive holders, add a little water, and place them in the soda crate. For some mood lighting, place one or two battery-operated LED candles on the soda crate. The diameter of the candles will be wider than the openings in the crate, so they can just sit on top. Because the individual components in this arrangement are modular and can be easily moved or replaced, the arrangement can be constantly freshened up to fit the occasion all through the year. Jonathan Fong is the author of three books: "Walls that Wow," "Flowers that Wow," and "Parties that Wow." He currently hosts the web series "Style With A Smile."